Spend your week paddling wild rivers, swimming in hidden springs, collecting seashells on a beach hike, adding dozens of birds to your life list, and visiting all six unique habitats that make up this area. Every day we will head out to a different location to paddle and explore. At night we will return to our luxury lodge with its cozy beds, hot water showers, and sumptuous riverside meals. We are lucky to have Wakulla Springs, one of Florida's best swimming holes (along with its enormous diving platform), only a few steps from our lodge. Day 1 — The leaders will pick up all participants at noon at Orlando International Airport on the first day. Our meeting place is at the bottom of the escalators by baggage claim 5A. We will then make the 4+ hour van ride to our base camp stopping on the way at a restaurant for lunch (not included in trip price). Basic kayak instruction will be given after dinner on the first night. Day 2 — After a wonderful breakfast, our group will head to the Wakulla River. At the put in, instructions will be given on the fundamentals of kayaking. Soon after, we will float down this extraordinary waterway. The source of the Wakulla River is Wakulla Springs. Because of the karst topography, the eastern part of Wakulla is filled with freshwater springs and circular groundwater-fed ponds and sinkholes. Early inhabitants dubbed the springs "strange and mysterious waters" -- a seemingly accurate name because in some locations spring water appears somewhat magically from the ground, runs downstream for several yards, and then disappears mysteriously below the surface once again. 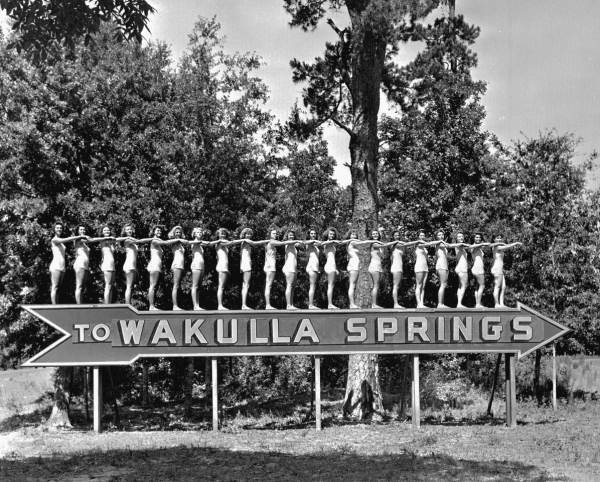 Of the many beautiful clear water springs in the region, the most famous is Wakulla Springs. 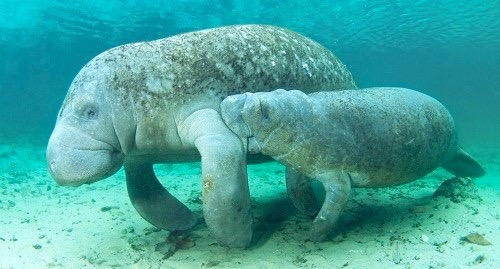 Wakulla Springs is one of the largest and deepest freshwater springs in the world. The spring flows up and out from an underground river at a rate of over 400,000 gallons per minute. Even at its deepest point of 185 feet, objects are sometimes visible near the bottom. As the spring water flows over land, it forms the equally clear Wakulla River. Day 3 — The Sopchoppy River originates in the wetlands of the Apalachicola National Forest west of Crawfordville in Wakulla County and runs 47 miles to the Ochlockonee River. Sixty percent of the blackwater river runs in the National Forest and St. Marks National Wildlife Refuge. It winds through dense forest, passes high sandy bluffs and limestone outcrops, and flows around white sandbars. The Florida National Scenic Trail follows the river for five miles between Oak Park Bridge and Bradwell Bay Wilderness Area. On past trips, people have always commented about how remote and wild this river feels. They also say it seems as if they were the first to ever paddle the river. Our group can expect to encounter the famous tupelo in full blooming splendor. The contrast of a huge, white, blooming canopy with flat blackwater is incredible. Day 4 — Today we paddle the Gulf. We start at white-sand beach and explore a shallow saltwater bay. This area is frequented by whooping cranes and mullet fishermen! After our paddle we head for San Marcos de Apalache Historic State Park. This is the site of the confluence of the Saint Marks and Wakulla rivers. Day 5 — The St. Marks River originates in the hardwood and cypress river swamps of the Red Hills area and flows 35 miles to the Apalachee Bay. The St. Marks River disappears underground at the historic site of Natural Bridge in Leon County and resurfaces a short distance south of the St. Marks Spring in Wakulla County. The St. Marks River joins the Wakulla River north of the bay at the San Marcos de Apalache Historic State Park. After our time on the river, we will make our way to St. Marks NWR. This is the home of abundant wildlife, especially birds. Last year our group spotted two bobcats, four whooping cranes, red cockaded woodpeckers, and numerous species of snakes. Wildflower lovers won't be disappointed because the deeper sloughs and ditches are filled with blooming irises, swamp lilies, arrow head, and coreopsis. The day's highlight will most likely be the gulf sunset viewed from the lighthouse. Day 6 — After breakfast, our group will head to the Wacissa River. Soon after we will float down one of the state's most pristine waterways. 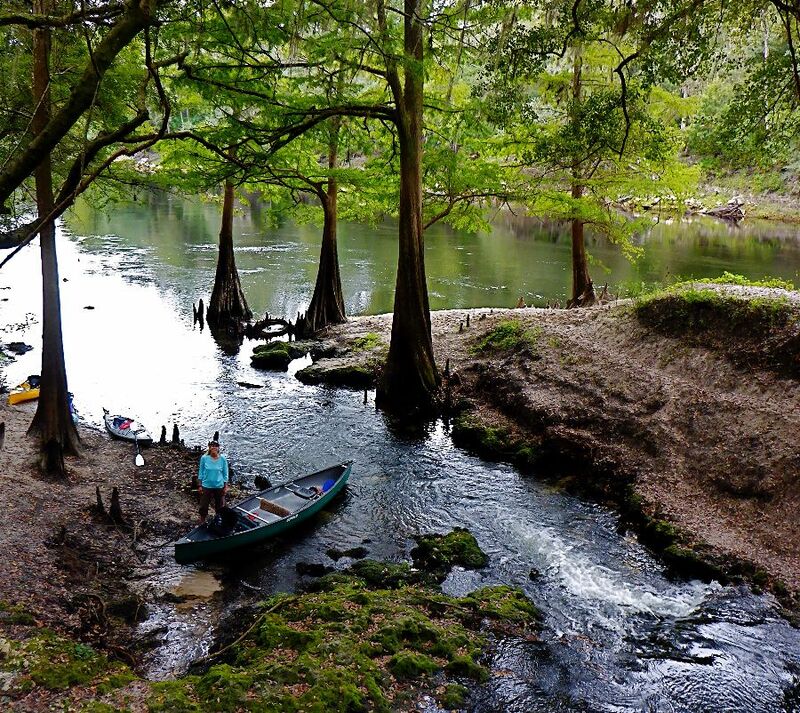 The Wacissa River is a clear, spring-fed river that originates in Jefferson County and flows 20 miles to the Gulf of Mexico. The 12 known springs are located in the upper 1.5 miles of the river. The river winds through swamps and marshes. A little ways past Goose Pasture is the Slave Canal. This canal was dug more than 170 years ago to transport cotton to the Gulf. In most people's opinion, this is Florida's premier wild river. Day 7 — By now most everyone will be in the routine of waking up, grabbing a cup of coffee, and taking a walk amongst state grand champion trees and a quick swim in the refreshing spring. Being our last day together, it's a good time to take a little bit longer to soak it all in -- it's been a long activity-packed week. At 9 a.m. we leave for the airport. The trip back to the Orlando Airport will take about 4-5 hours. In 1937, financier Edward Ball took his idea of quiet elegance and placed it gently in the most serene place he’d found on his international travels, Wakulla Springs. He imported marble and tile, hired artisans in iron and stone, and introduced to the world a most unique retreat. In 1931 Ball bought the Springs and Lodge site from the Christy brothers, who had a small restaurant where the present boat dock stands. He personally handled all facets of the design and construction of Wakulla Springs Lodge, outlining the floor plan, choosing the architects and materials, and insisting on meticulous attention to every detail. Construction of the two-story hotel began in 1935. The original roof was of wood with steel superstructure. It was replaced after a fire, started unfortunately by a hapless trainee during the Lodge’s use as a military training facility during World War II. The new roof was reinforced with slate and metal on steel to render it totally fireproof. Ball’s eye to quality and durability can also be seen through his lavish use of Tennessee marble throughout the Lodge on floors, baseboards, thresholds, counters, stairwells, desk tops and table tops in the gift shop, lobby, and veranda. The marble is fitted so meticulously no grout can be seen. The world’s longest known marble bar, at 70 feet 3 inches, is in the Soda Fountain/Gift Shop. This marble is “face matched.” Eight pieces were cut from one block of marble. This process is known as quarter-sawing: a block of marble is cut in half, cut in half again, and each quarter is again cut in half to get eight panels, thereby producing a matching grain pattern. The use of “heart” cypress can also be seen throughout the Lodge. Heart cypress is the very interior of the tree. All of the cypress logs used in the Lodge were obtained locally as “dead heads”—cypress that had fallen into water and been immersed for 50 years or longer, making it impervious to rot.The Great Lobby itself heads the list with use of this wood. Although this room is great in size, the height of the ceiling is about 16 feet, a huge expanse of hand-hewn cypress panels is still visible. The expansive transverse “beams” are actually steel girders faced with cypress planks. The lobby ceiling gets the most attention for its decorative painting of local wildlife scenes. Close examination shows it to be a combination of European folk art, intricate Arabic scroll work, and Native American influences. Two special features grace the rim of the lobby. The marble and iron staircase and the original elevator are both Art Deco masterpieces. The interior of the elevator walls are walnut, with quarter sewn, face matched grain and marquetry panels—an inlay using varied colored woods. This is the only known surviving period Art Deco elevator still in use. The staircase’s three landings are massive marble panels with face-matched grain that were cut from one block. The risers and treads also are matched panel of marble and granite. The wrought iron railing was made on site and illustrates wildlife from the river. The limpkins and herons in the balustrade are true to life in outline and size. True to Ball’s word to preserve the area and to create a serene and peaceful retreat, the Lodge at Wakulla Springs is an example of precise craftsmanship and offers visitors a timeless glimpse into Florida’s pristine and elegant past. Built in the 1930s and listed on the National Register of Historic Places, the Wakulla Springs Lodge features 27 guest rooms, each with a spacious marble bathroom, walk-in closet, and antique or period furniture. All rooms have a telephone and data port. For a quiet and relaxing stay, rooms have no televisions. Located on the second floor, guestrooms are accessible via the elevator or numerous staircases. Rooms are double-occupancy and have either a queen bed or two doubles. The lodge has a resturaunt, where we will eat dinner at one evening (not covered in the trip price). All other dinners will be prepared and served by the leaders riverside. Meals will reflect traditional local cultures. Participants can expect shrimp and grits, crawfish étouffée, and fresh Cuban roast pork. People with dietary restrictions should call the trip leader to discuss their options. Lunches will be picnic-style every day on the water. for more news and photos!